Top Gear’s Jeremy Clarkson has done some crazy things over the years. 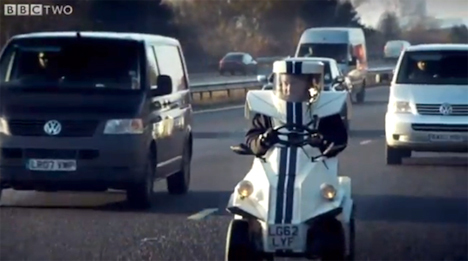 In this episode he profiles and demonstrates the world’s smallest car – on England’s notoriously busy A3 motorway, no less. It’s comical, scary and informative – the episode, not the car. The P45 is the tiny car that got it’s wheels broken in on that crazy highway. 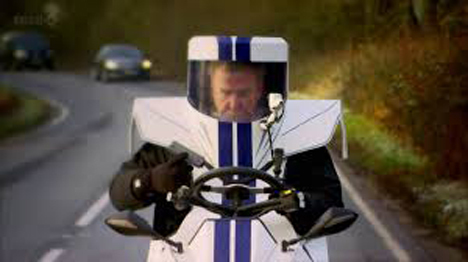 This one-seater sort of turns the driver, in this case Clarkson (no stranger to parody), into a human Transformer. It’s form fitting, in that it fits like a mechanical suit. While it only boasts a 1.7 liter, 2-stoke 100 CC engine, it’s still fitted with four wheel, all-terrain drive. The P45 also has all the typical necessities needed to make it street legal: License plate, turn signals, headlights, etc. But thanks to Clarkson’s laugh-out-loud demonstration, it comes with an unofficial ‘don’t try this at home’ warning. See more in Cars & Trucks or under Transportation. January, 2014.